Test yourself on each of the Official DVSA questions for motorcycle riders grouped into the 14 DVSA Theory Test Categories. Each question uses our unique traffic light progress system to help you quickly recognise which questions have been not been attempted, which have been correctly answered and which have not. This information is summarised and totalled for each of the 14 DSVA Categories. If you are not sure of the answer use the Study button to find the theory behind the question including the DVSA's own Official knowledge and understanding text. Additional theory is provided through the Highway Code, Motorcycle riding the essential skills and our own supplementary notes. The Case Study section provides 14 Case Studies each with 5 questions. 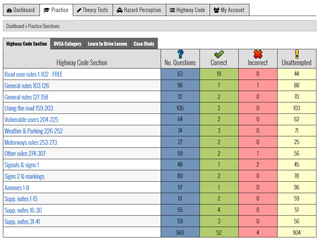 There is a Case Study for each of the 14 different Official DVSA test categories. 14 Bike multiple choice Theory Tests using Official DVSA practice questions, answers and explanations. The 14 tests have also been specially configured so that they can be used as a learning programme - for those in a real hurry who want to undertake the minimum amount of preparation but still ensure test success. These 14 tests cover the key practice questions designed to cover every aspect of the theory that you need to know and understand. Therefore if you don't have time to complete the practice and study you can simply undertake these 14 tests. Ten highly realistic additional Hazard Perception Test simulations to help you fully prepare for the hazard perception part of the Theory Test provided by training experts LDC. Each test contains 14 hazard clips to try out and review your score giving you an extra 140 hazard clips to practice with (i.e. 168 in total). No other online product offers you so many hazard clips of this quality. Learn the Highway Code as you prepare for your Bike Theory Test and to help you learn to drive. Contains all the latest information.